Will it actually be effective? We need to look at each element and all the ingredients before we can make that determination. 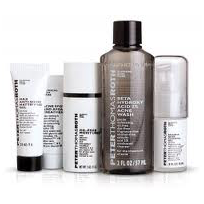 The main ingredients found in the Peter Thomas Roth’s Acne Treatment are vitamin C, vitamin E and aloe vera. These are antioxidants and soothers and have an overall positive effect on skin. Aloe vera is a strong healer in regard to burns, specifically sun burns. This may lend a bit of aid to the healing of recent acne scaring but there is no proof that these ingredients can do anything to eliminate or manage an acne problem of any kind. The problem with this treatment system is that first, it does not actually provide a cleanser, and second, it does not seem to use any proven acne fighting ingredients. Its price is comparable to higher grade treatments, but its formula is not. We would not waste money on this product.